Pakistani PM says, "If the war is thrust on us, we will stand united"
WASHINGTON (CNN) -- India's air force geared up for possible missions against suspected terrorist camps in Pakistan in the immediate aftermath of November's Mumbai attacks, U.S. military officials told CNN Monday. One U.S. official said India's air force "went on alert" after the attacks in Mumbai. Pakistan said it would defend itself if attacked. "We don't want to go to war," Pakistan Prime Minister Yousuf Gilani announced during a speech at the National Assembly on Monday. "But if the war is thrust on us, we will stand united like a respectful nation." While the officials characterized the Indian actions as preliminary preparations to position the air force if strikes were ordered, the comments indicate that the two nuclear powers were perhaps closer to conflict than previously acknowledged. Three Pentagon officials, who spoke on condition of anonymity, have individually confirmed to CNN that the United States has information indicating that India began to prepare air force personnel for a possible mission. The officials offered few details, but one said India's air force "went on alert." A second official said the United States concluded these preliminary preparations would put India in a position to move swiftly against suspected terrorist camps and targets inside Pakistan, before adding that a number of senior U.S. officials urged India to exercise restraint during this time. An Indian air force official had no comment. 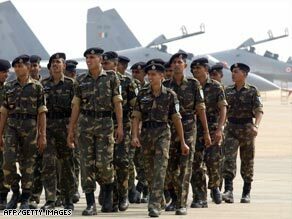 CNN sister network CNN-IBN reported last week that the air force had been put on its highest level of readiness and that the aircraft had been armed. "We are certainly against terrorism, but that doesn't mean that we go at war with any country," Indian Air Chief Marshal Fali Homi Major told CNN-IBN Thursday, adding that any decision on military action would be "up to the government because the air force and the army are there only to carry out the will of the government." Air Commodore Homayoon Ziqar, a spokesman for the Pakistani air force, told CNN that Pakistan is not on heightened alert at the moment. "Everything is normal," he said. Another source in Pakistan's military also said the air force is not on heightened alert, but added, "We are always ready, on weekends, on holidays, no matter what the circumstances." Since the Mumbai attacks, Pakistani security forces raided a camp near Muzaffarabad, the capital of Pakistani-controlled Kashmir, according to military sources. Also, Pakistani authorities have banned a charity linked to last month's attacks and placed its leader under house arrest. The move came after the U.N. Security Council designated the charity, Jamaat-ud-Dawa, a terror organization because of its links to Lashkar-e-Tayyiba. Gilani's promise that Pakistan would defend itself came amid mounting international pressure for him to crack down on Lashkar-e-Tayyiba. U.S. Joint Chiefs Chairman Adm. Mike Mullen said he was "encouraged" that Pakistan arrested two of the group's top leaders last week, saying it amounted to the first steps toward determining who plotted the Mumbai siege. Indian police say the only surviving suspect from the Mumbai attacks, identified by Indian authorities as 21-year-old Mohammad Ajmal Kasab, is from Pakistan's Punjab province and the other nine attackers also were from Pakistan. Pakistani officials have denied that assertion, blaming instead "stateless actors." Until now, the Bush Administration has publicly said it saw no signs of military movement by India and no indication that the Indian government was preparing any type of retaliation. The Pentagon officials broadly described the activity as checking the status of crews, fighter jets and weapons that were available. The extent of the reported preparation was not immediately known. Also, one of the Pentagon officials confirmed that the United States has intelligence indicating a single Indian aircraft violated Pakistani airspace twice on Saturday. The United States believes the incursion was inadvertent, the official said, adding that there is no information to indicate it was planned. Meanwhile, suspected U.S. missile strikes continued to hammer Pakistan's tribal region, killing three people in a North Waziristan village Monday evening, according to a Pakistani military official. Monday's strike is the 29th suspected U.S. missile strike in Pakistan this year.